Are you quickly running out of storage space? When your rider mower and lawn equipment starts to take over your garage, it may be time to consider another solution. An outdoor shed is a perfect way to add plenty of extra storage space without paying for a costly home addition. Plus, sheds can even add to the look of your landscaping and increase your home’s value! But with tons of options available, how will you choose the right shed for your home? We have you covered! Keep reading to discover the top 10 things to take into consideration when choosing an outdoor shed. The first thing you should decide on is the size of your new shed. Write down everything you’ll want to store, no matter how small. 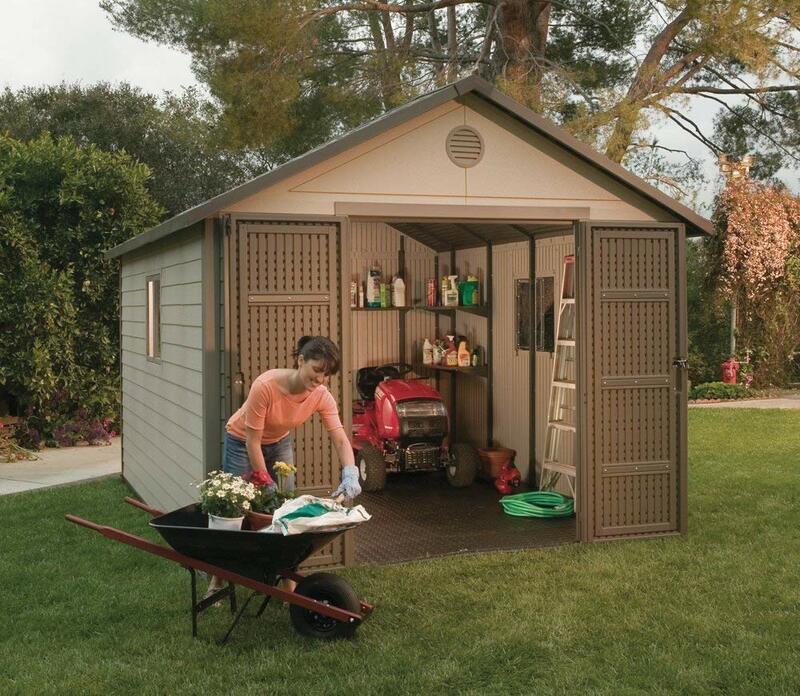 Ideally, you’ll want a shed that’s big enough to fit everything you need and give you a little extra space. Not only will this ensure you can fit more belongings into your shed as needed, but it gives you room to move things around instead of having to climb over lawn mowers and snow blowers. However, if you have a small yard, you also want to be careful not to go too big. A large shed can easily take up a huge chunk of your yard. If you plan on packing your shed full of heavy equipment, you’ll want to make sure it has good accessibility. You may need a doorway ramp to haul equipment in and out of your shed. If you have several big pieces, you may also want to consider a back door that will give you access to the items in the back of your shed without climbing over the heavy equipment in the front. One thing many homeowners overlook when buying a shed is the possibility of needing a permit. While not always necessary, some cities will require special permits for sheds (particularly big sheds). They may also restrict where you can place your shed or the height of your shed. Homeowners’ associations may also have some restrictions. So, be sure you do the proper research before making a purchase. Just like with any large purchase, cost will always be a factor to consider. Make sure you decide on a budget before you go shopping, so you can narrow down your search to sheds you can comfortably afford. While cost is an important factor for many, you also want to take quality into consideration. For most people, it’s worth it to raise their budget to get a high-quality shed that will last for many years, rather than having to buy a cheap shed every 5 years or so. How the shed is made and what it is made out of can play a huge role in cost and quality. So, it’s important to understand all your options. Wood, plastic, and metal are the three most common shed materials. Wood tends to be the most expensive, but they’re easily customizable. They are also sturdy, although if you live in an area with harsh weather, they may rot over time. Plastic sheds (also called resin sheds) have been growing in popularity. They’re lighter and often more durable than wooden sheds. However, they can’t stand the weight of heavy items being hung on walls like a wood shed can. Metal sheds are usually the cheapest option but also the weakest. The DIY assembly kits can also be very difficult, which may leave you paying more to hire a professional to put it together. Pole buildings are also a great option as they are affordable, sturdy, and allow you to have a larger doorway. Make sure you read more about them before making a decision. Of course, the work isn’t done once you buy and assemble your shed. You’ll also likely need to maintain it over time. Most wood sheds need as much maintenance as a house. They’ll need to be repainted and rotted parts may need to be replaced over time. Metal sheds need to be repainted fairly often. If the protective coating is damaged, your shed will likely rust quickly. If you’re looking for a very low-maintenance shed, plastic may be the best material for you. While the main purpose of a shed is to provide extra storage, you also want to ensure it looks good. After all, you’ll have to see it every time you look outside. Ideally, you’ll want a shed that compliments your home’s style. For example, a rustic barn-inspired shed would look out of place with a modern or formal home. Choosing your shed is only half the battle. Once you buy it, you’ll also have to worry about assembly. Shed kits are a popular option. Oftentimes they are cheaper, and many sheds can be put together by someone without extensive construction knowledge. However, metal sheds, in particular, can be hard to assemble yourself. If you don’t want to worry about assembly, you can either pay a professional to put it together or opt for a prebuilt shed. As the name suggests, prebuilt sheds are already assembled in a factory and are delivered in one piece. You’ll just need to ensure there’s plenty of room for a forklift to drive into your backyard to place the shed. Once your shed is in place, you may want to make some final touches to ensure it fits in with the rest of your landscaping. Depending on the shed you choose, you may be able to paint, add DIY shutters, or place window boxes. Of course, you can also personalize it by planting flowers or shrubs next to the shed or adding a pathway from your porch to the shed. Don’t just by the first shed you see. From size and accessibility to style and assembly, there are many considerations to think about when buying the right outdoor shed for your home. Are you ready to move onto your home’s interior? Check out this list of home improvements that will boost your resell value.